Your residential garage door is likely the last thing you see when you leave your home in the morning and the first thing you see upon your return in the afternoon or evening. Garage doors not only provide an important function in keeping the contents of your garage safe and secure, but they also have the added feature of providing style to your home. A custom design garage door can boost both the appearance and the functionality of your home’s exterior. Our installation experts at Action Garage Door Repair Specialists explain the benefits of customizing a new garage door for your Dallas home. Instead of ordering the same type of garage door in the same color and style that all of your neighbors have, installing a customized door for your garage brings an added note of class and style to your home. When directing visitors to your home, you can point out your garage door as a recognizable feature of your home. A new garage door also brings an added level of safety and security for your home. In addition, all of our garage doors are outfitted with the latest in safety features for the protection of your family. With our custom garage door design tool, you can choose the door type, color, window and panel options that best coordinate with your home. We offer up front estimates on all new garage door installations. At Action Garage Door Repair Specialists, we have built a solid reputation throughout the Dallas, TX metropolitan area for providing customized designs of garage doors for all types of homes. Our installation team takes pride in performing on-time, efficient and trustworthy garage door installation in Dallas. No matter what type of garage door need you have, we look forward to assisting you. 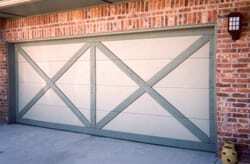 Call us today at 972-254-4040 for more information on a custom new garage door for your Dallas, TX home.